The scheduling interface in a Browser is different on the R365 Mobile App; however, the functionality is the same. Screenshots of both will be provided under each function below. This is where you can manage your personal contact info, view your recent time clock punches, and manage which days you're available for scheduling. There are 3 tabs on this screen (along the bottom in the mobile app and near the top in the web browser): Info, Punches, Availability. This is where you set personal contact info such as your photo, email, phone #, and address. Preferred Contact Method is an important field. This can be set to Text, Email, or Both. When the manager sends out employee communications, it will be sent to you based on what you've selected here. If you select Email then you must provide an email address and if you select Text then you must provide a mobile phone. When finished updating your information, click Save. This is a read-only view of recent time clock punches as imported from the POS. In the mobile app, this first shows a summary view of availability for every day of the week. Click the Edit in the top right corner to change availability. This will open a screen where you manage 1 day at a time (second screenshot below). It defaults to the first day of the week, but using the day dropdown at the top of the screen you can change to a different day of the week. Availability can be set as "Available All Day", "Unavailable All Day", or you can set specific availability start and end times. When finished setting that day, click Save in the upper right corner. In a web browser, it shows your availability for all days of the week and you can edit any of them all in the same screen. To view shifts in the mobile app, click Shifts from the main menu. In the web browser, click Schedule in the left hand navigation pane. This is where you can view your upcoming scheduled shifts or unassigned shifts to be claimed, and make requests on them. 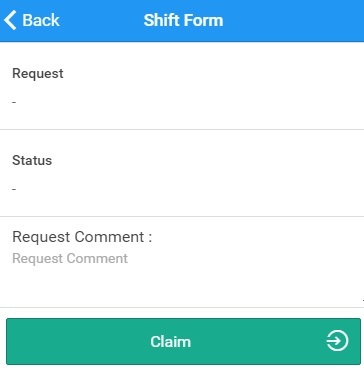 In the mobile app, Shifts and Unassigned Shifts are separated into tabs at the bottom of the screen. In the web, they are both accessed on the schedule calendar screen. Clicking the shift, instead of swiping, will open the shift details. On the shift details form, there are 2 tabs at the bottom to view the shift details (Shift Form tab) or make a request to drop or trade this shift (Request tab). If this shift is at a site other than the restaurant location, you can scroll to the bottom of the shift to see the site name and address and can click the Open Map button (orange arrow in image below) to open a map on your phone of the site. This is where you both view existing shifts and claim unassigned shifts. Unassigned shifts are listed in the top row of the calendar and your assigned shifts are shown in the next row. In mobile, click Announcements from the main menu to see all active announcements from the manager. This is where you can view the status of pending requests such as time off, shift trade, shift drop, or claiming an open shift. Click here for more information on Schedule Requests. Time off requests are also made from this screen. In mobile, to create a new time off request, click the "+ Time Off" button in the top right corner of the Requests List. Time off requests are described in more detail later in this training. In the web browser, the request list is accessed from the left hand navigation by clicking Requests. Double click a row to open that request. To create a time off request, click Scheduling - Time Off Request from the top ribbon. Click this if you want to change your password and a window will open for you to provide the old password as well as a new password and the press Save. In mobile it is located in the main menu. IN the web it is located by hovering over your name in the top right corner and selecting Change Password. Click this to logout of the app. In mobile it is located in the main menu. In the web it is located by hovering over your name in the top right corner and selecting Log Out.